Over the past couple of weeks, my team and I have been brainstorming, strategizing and finalizing a social media campaign for one of our clients. A lot more planning goes into developing a social media marketing strategy than you may think, and for good reason. If things aren’t carefully crafted, your campaign and your business could suffer. I came across a lot of really great campaigns to reference during my research and got off on a bit of a reading tangent when I noticed different social media campaigns than what I frequently tend to see: social media campaigns from the heart. By that, I mean a campaign that aims to spread awareness and well being, without offering anything more than a sense of accomplishment in return to the people who choose to participate. Just because a campaign focuses on a good cause or message, though, it isn’t guaranteed to be successful. With that said, I’d like to take a look at two campaigns I found to be inspirational and delve into what worked for them and what didn’t. Elizabeth Arden, a leading cosmetics company, launched its “Pin It to Give It” Campaign last year and revived it for a second go this month. 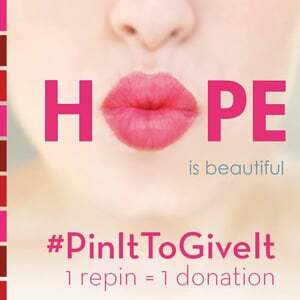 In support of Look Good Feel Better— a public service program dedicated to improving the self-esteem and quality of life of women undergoing cancer treatment—Elizabeth Arden is pledging to donate one lipstick to the charitable partner for every image repinned to the #PinItToGiveIt Pinterest board. Even though it’s a Pinterest campaign, Elizabeth Arden is cross promoting this among all of its social channels. This will only help build more a connection amongst its fans, as people can discover multiple platforms the company communicates from. Also, Elizabeth Arden strategically chose to focus its promotion on a charity that helps women undergoing cancer treatments during October – Breast Cancer Awareness Month. The first thing Elizabeth Arden did correctly was to capitalize on current promotional trends. People love “Pin It to Win” promotions because the action required is minimal while the reward can be substantial. Elizabeth Arden took a more creative approach and decided the giveaway part of the promotion wouldn’t be going to the participants, but rather to women in greater need. “Sure, the company could just donate 10,000 lipsticks, but asking consumers to participate shines a brighter spotlight on the charity,” explained a social media strategist. By cross promoting on social channels and including a charitable partner during Breast Cancer Awareness Month, Elizabeth Arden set itself up for another successful social media campaign. Also, the campaign didn’t seem to pack as big of a punch as I would have initially guessed. USA Today wrote how “Marshal Cohen, chief retail analyst at The NPD Group, said the latest campaign won't likely have much political effect because it lacks the kind of punishment that makes lawmakers think twice, like an impeachment drive." Through my research, I couldn’t find a clear explanation as to how exactly these petitions were going to be successfully delivered. The engagement people were asked to take was simple and thought to encourage more results—in the very least, people were to like a post; at the most, physically sign a petition. But the lack of public engagement actually seemed to hurt the campaign instead of better it. Boyd Neil, senior vice president at Hill+Knowlton Strategies, faults “#ComeTogether for not designing the campaign in ways that could encourage people to be more engaged. For example, Starbucks could have asked those who signed the petition to provide their zip codes so they could be sent the name and phone number of their congressional representative. Another option…is asking signers for their email addresses and sending them suggested actions to take." These missing steps could have made the campaign much more meaningful. Have you developed a social media campaign recently? What steps did you take to ensure its success? Share in the comments section below! As a Senior Consultant at Kuno Creative, Justine takes her passion for inbound marketing to heart by developing content and demand generation strategies. When she's not in the office, Justine enjoys her time exploring downtown Cleveland and all it has to offer. You can connect with her on Twitter or LinkedIn.